I’m a fan of John Wayne’s movies, as are most people I would imagine. I thought I had seen most or knew of them all, except for that raft of short westerns he made back in the thirties before he hit it big time with Stagecoach. 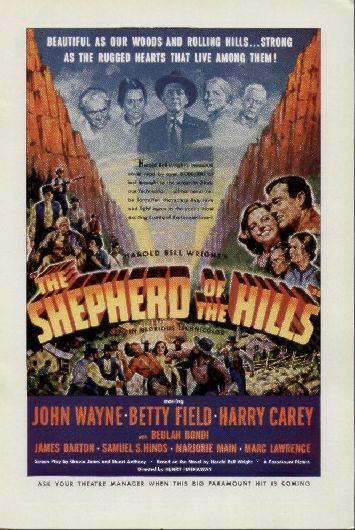 Then I saw THE SHEPHERD OF THE HILLS, a 1941 film where Wayne plays an Ozark mountain moonshiner, one I had never came across in my years. It’s based on a novel by Harold Bell Wright. It’s a tale set sometime after the Civil War, but not to long as a store clerk counting out money in one scene stops, removes a bill, saying, “Confederate,” before continuing. John Wayne is “Young Matt” Masters, a man raised by his Aunt Molly(Beulah Bondi), a bitter, old crone who’s filled him with hate for the man, his father, who deserted her sister since he was a small boy. It’s his duty to kill his father when he finds him. Her son was struck by lightning and can only make grunting noises. Some family members, not Wayne, call him the “idjit.” That’s added to the curse brought on by Matt’s father deserting everyone. It’s all made the family not well liked in the hills. Betty Field is Sammy Lane, a young woman in love with Matt. Child-like at times, superstitious(she covers her eyes, mutters something, marks a cross in the dirt, then spits on it, more than once), at other times she shows wisdom far beyond her years. Harry Carey, Sr. is the title character, Daniel Howitt, a mystery man who shows up out of the blue, wanting to buy land and settle down. He helps Sammy’s father, shot by “revenoors,” without asking why, and saves a small girl near death who’s breathing is clogged. He gradually starts winning the suspicious mountain folk over, except Aunt Polly, who still gladly excepts his money when he buys Moanin’ Meadows from her at an exorbitant rate($100 down, $75 a month until $1,000 is paid). John Wayne is not happy. It’s his old family land, his mother is buried there, and he’s upset with Howitt, trying to drive him off. But even he begins to warm to the friendly man. It doesn’t take a genius to figure out who Howitt really is. Sammy figures it out early on after all about halfway through the picture. She sees it in their faces, but exacts a promise from Howitt to tell Matt the truth. Things go to hell, so to speak, from that point. I couldn’t get over the beautiful scenery, great cinematography here. I read it was Wayne’s first color movie. Full length I guess they mean, as most of those early thirties short western were in color. Directed by Henry Hathaway, it was a remake of a 1919 film. I like this one quite a lot. Never guessed the reason Howitt left all those years before. John Wayne shows a range of acting very early in his career in this one. I’m starting to get into this Ereader thing since I figured out it wasn’t as bad as I’d thought it might be. These are the second group I picked up after downloading Amazon’s free Kindle application. They are a family effort. Burl Barer is Lee Goldberg’s uncle. Burl Barer writes true crime books, a critical study of Leslie Charteris’ Saint, a book on Mel Gibson’s version of Maverick, a novelization of the Val Kilmer film The Saint, and an original Saint novel. I intend to post on that one Friday. Lee Goldberg makes a living writing for television and movies, wrote some fine original novels, and has written the Diagnosis: Murder novels, a series in which he served as Executive Producer for a few years, and the Monk novels. The two listed here are THREE WAYS TO DIE, a group of short stories, two about writers and two with a cop character, one overlapping of course. I’d read REMAINDERED before, which was the overlap of writer and cop. JUSTICE is the fourth book in his JUSTICE series, written while he was in college but never making it into book form as the Publisher went bankrupt first. The series was originally called .357 Vigilante as by Ian Ludlow and was part of that flurry of men’s adventure that hit with The Executioner. The four are available individually or in a four pack. I only bought the fourth because I have the first three in the original paperback.